Winter is the time for rereading. Well, once mock exams are out of the way (but that's a whole other story…). Like I was saying, there's nothing better than picking up a well-loved, dog-eared copy of one of your favourites and delving back into the author's world. So, this winter, that's exactly what I intend to do. Although, with more tea and biscuits involved, preferably. THE BELL JAR by Sylvia Plath: The Bell Jar chronicles the crack-up of Esther Greenwood: brilliant, beautiful, enormously talented, and successful, but slowly going under – maybe for the last time. I've reread this book a couple of times, but it's one of those books that never feels 'over-read'. So, this winter, I'm planning to dedicate yet another day to Esther Greenwood. And, each time I read this book, I see different tones and shades within Esther and her tale, changing my perspective on everything. DEATHLESS by Cathrynne M. Valente: The young Marya Morevna transforms from a clever child of the revolution, to Koschei’s beautiful bride, to his eventual undoing. Along the way there are Stalinist house elves, magical quests, secrecy and bureaucracy, and games of lust and power. I read this book for the first time in August this year, and I fell in love with it. It definitely won't be to everyone's taste, but it was just the right amount of darkness and magic for me. Definitely the perfect reread for winter. NORTHANGER ABBEY by Jane Austen: In Northanger Abbey, a young woman's penchant for sensational Gothic novels leads to misunderstandings in the matters of the heart. THE SECRET HISTORY by Donna Tartt: Richard Papen, a relatively impoverished student at a New England college, falls in with an exclusive clique of rich, worldly Greek scholars and soon learns the dreadful secret that keeps them together. Can you notice a pattern here? Yep, the majority of the books on the list are fairly morbid. The Secret History is just that… and so much more. Intriguing, intelligent, captivating, compulsively readable, one of my all-time favourites… now, tell me, why would't I want to reread this? I read this book right back in January, and it's been on my mind ever since… every time I see the spine of this book, I'm tempted to dive back into Gaiman's tale. And so, this winter, I'll follow these impulses, and finish the year with the same book I started it with. Have you read any of these books? Do you plan on rereading anything this winter? Rereading is sometimes so much fun. I'm very curious about Deathless, Northanger abbey and The ocean at the end of the lane. I liked Catherynne's first book in her Fairyland series and I've loved many of Neil Gaiman's books. Happy rereading! Yep! It's like a guaranteed great read (which is particularly enjoyable when you're a book blogger). Deathless is incredible – if a wee bit confusing at times! And The Ocean at the End of Lane is gorgeous… I think you'd enjoy it, given it feels so fairytale-esque at times! 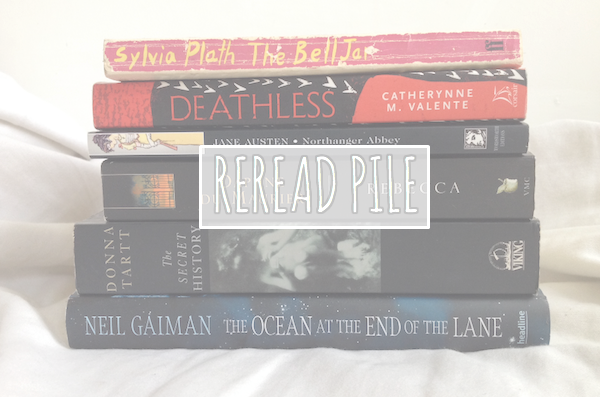 It's nice to see Deathless on a list for something you'd re-read as I've had it on my TBR pile for ages now and am really looking forward to it - it must be good if you would read it again. It's wonderful. :) Northanger Abbey is absolutely spectacular – if you're an Austen fan, it's a must! I need to just read these. Period. XD Hehe. There is so not enough time for all the books I'd like to read but I actually own The Ocean At The End of the Lane so yessss, I need to read that for sure. I'd also love to read The Bell Jar. I read two books back to back (BZRK and Belthzar) that made huge references to it, so it makes me super curious about it! Thanks for stopping by @ Notebook Sisters/Paper Fury! Ooh I read Northanger Abbey for my English class when I was a senior in high school and it was so creepy! I never finished it (I went on sparknotes instead to find out the ending) so I think I'll re-read it someday.